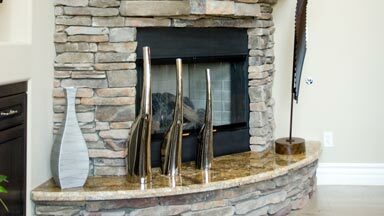 Chimney Lining | Chimney Relining | Chimney | Kent Chimney Inc. If your annual chimney inspection revealed a cracked chimney flue liner, it’ll need to be replaced as soon as possible. Both the Chimney Safety Institute of America and the National Fire Protection Association warn against using a damaged chimney flue liner because of the risk for house fires. A chimney liner is responsible for safely carrying heat and combustion gases out of your home when you have a fire in the fireplace. Without the chimney flue liner, there would be nothing to stop chimney walls from catching fire once a high enough temperature was reached. Our chimney contractors have experience with flue liner installation, which means you can expect them to work efficiently and produce quality results. A new chimney flue liner will prevent your chimney from becoming a fire hazard. Flue liners are designed to move heat and gases up through the chimney flue and away from the home. The chimney relining contractors at Kent Chimney Inc. always strive to help homeowners enjoy their fireplaces and chimneys for as long as possible. If you are interested in learning more about our chimney lining services or our chimney relining services, give us a call at (616) 949-7722.